Family vacations in Georgia are always more fun when you have a great place to stay. 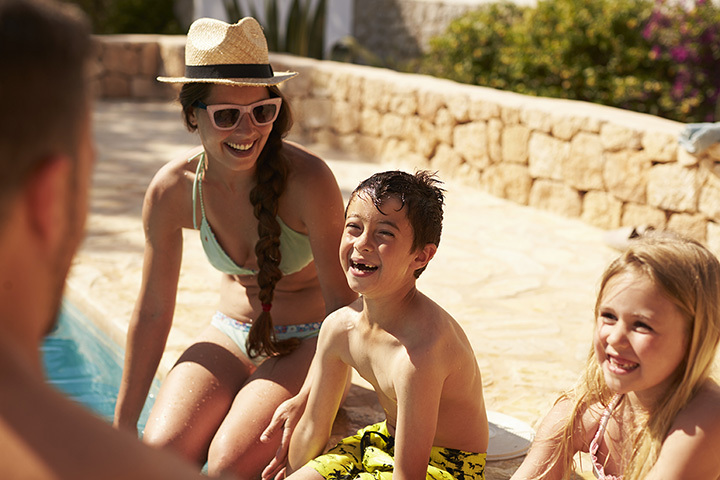 Heading to a family resort guarantees no shortage of fun activities for everyone. Plus, many of them offer everything you need—including restaurants—to make your trip unforgettable. Make memories at these 10 best resorts for families in Georgia. Every day you stay takes your family vacation to new heights. Historic Banning Mills is popular for the variety of on-site activities, including the record-breaking zip wire course and world’s tallest climbing wall. Guests can take their pick of rooms with creek-side views or the ultra-swanky treehouses, then head out for an adventure on a kayak, horseback, nature trail, rock wall, or other epic activity. Brand new to Georgia, this location is the only one of its kind in the state. Known for its sprawling indoor waterpark that can be enjoyed year-round, families of all sorts can get their thrill on without ever leaving the property. Rooms are cozy and reminiscent of an old-fashioned cabin, dining options are abundant, and the fun is non-stop. Each day spent here truly feels like a vacation. With beautiful ocean views, direct beach access, a swimming pool, and feels-like-home accommodations, you’ve got countless ways to relax and enjoy some quality family time. Villas are equipped with full kitchens, plus there are on-site eateries to keep you fueled throughout your day. This postcard-perfect property is one of the most iconic destinations in the Northeast Georgia mountains. Nestled on a rolling, lush green landscape, the resort offers tons of family-friendly activities, including a farm zoo, horseback riding, and swimming pool. Their restaurant is also top-notch for family-style breakfast, lunch, or dinner, and it’s truly one of the best parts of your stay. The Margaritaville lifestyle is more family-friendly than you may realize. Situated on Lake Lanier in the famed Lake Lanier Islands, you can bring along a boat for fun family times on the water, enjoy the water slides included with your stay, indulge in delicious meals on-site, and make a splash in the wave pool. No boat? No problem! You can easily book a rental with your stay. A favorite family destination year-round, staying at Stone Mountain Park keeps you close to all the action at iconic Stone Mountain. Bring a tent or RV, or rent a yurt or RV to save yourself the trouble. The campground itself has its fair share of amenities, including a swimming pool, playground, general store, and volleyball court. You’ll be minutes from the main attractions at the park, so you can enjoy non-stop action during your trip. Everyone’s favorite picnic basket-stealing bear has his very own RV and camping resort, and everyone's invited! There’s never been a campground as kid-friendly as this one: a train, jump pad, live animal displays, play area, and swimming pool are just a few of the ways to spend your days. RVs, tents, and cabins provide a full range of accommodations. A favorite spot for Lake Lanier visitors, this place is perfect for families. Ziplines, a saltwater pool, and lake access are just a few of the hot spots that will delight and entertain. They have several different rooms to accommodate families of all sizes. Get back to nature and the simpler things in life by staying at a camping resort. While seemingly out in the middle of nowhere, families can enjoy fewer distractions while spending more time together and making fond memories. It’s also not far from other area attractions and restaurants in the Northeast Georgia mountains. This unique mountain getaway is equal parts rustic, charming, peaceful, and exciting. From horses and miles of horseback riding trails to swimming and fishing areas, there’s plenty to do here for all ages and interests. The ranch is surrounded by the quiet beauty of the mountains, but other activities are never far away.